That was before Authentic Models. They’re interested in appealing to the mind as well as to the eye. Designed to mirror the unique beauty of antique objects and curiosities, Authentic Models’ pieces come across as both functional and decorative, lovingly recreated from materials that don’t break the traditional mould. The Victorians prided themselves on their watch-making ability. Indeed, some of the best examples of pocket watches and carriage clocks around come from craftsmen of the Victorian era. 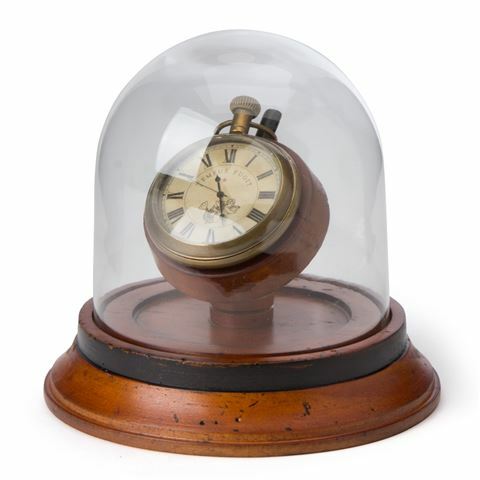 Inspired by this punctual era of fancy is the Victorian Dome Watch: a vintage-look pocket watch kept safe beneath a glass dome. A purposely-aged, wooden base finishes up this set, which is as useful and functional as it is pleasing to the eye. Made from glass, wood and brass. Functioning pocket watch in display stand. Requires 2 x cell batteries (included). Includes instructions on how to set and operate your watch. Dimensions: 13cm (h) x 13cm (w).